Can Hot Tubs Be Installed Indoors? Posted on December 7, 2017 , in Hot Tubs. If you are looking to install a new hot tub you may be considering a few installation options. Today, hot tubs can be installed in a variety of locations. They can work in the ground, on top of the ground, halfway, and inside your home. When installed indoors it does add a unique look and feel to your home while adding a luxurious feel to a home gym area or indoor spa. Plus, when you have an indoor hot tub you get to enjoy it year-round in a controlled climate while bathing in complete privacy. If installing a hot tub indoors sounds like an exciting option you may be interested in, here are a few important things to consider first. In order to properly take care of your home, when installing an indoor hot tub, make sure there is sufficient ventilation. This way you will not have to worry about mold or undesirable odors. Make sure the fan does not make too much noise so it does not distract from your hot tub experience. Fans should also be rust resistant with appropriate handling of the moisture that will be dispersed into the room. For additional assistance with your proper ventilation needs, consult an HVAC professional to help you with your indoor hot tub installation. Choose carefully what type of flooring will be surrounding your hot tub area. 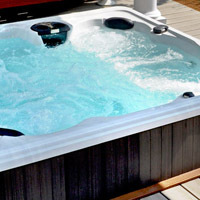 Water may disperse when getting in and out of a hot tub or when unruly guests decide to splash around a bit too much. This can create slippery or sometimes moldy floors. For this reason, avoid wood and carpet. Try to go for a tile floor that provides good traction or non-slip options, proper drainage, and excellent quality. When it comes to indoor hot tubs, bigger is not always better. You want to make sure there is enough space available for the hot tub you wish to buy. Make sure there is enough room for installation and enjoyable use. This means enough room to walk around your hot tub as well as enough room to fit it through existing doorways and staircases. This one may not have occurred to you until the last second! Prepare ahead of time and make sure there is a convenient water source available to fill up your hot tub. Hot tubs already come equipped with self-contained plumbing so all you really need is a hose installed in the room located near the hot tub. When you purchase an indoor hot tub you are investing in your wellness and the enjoyment of your own home. An indoor hot tub is filled with benefits, including being able to use it whenever you wish. If you are experiencing muscle pains or headaches, you can use your hot tub no matter what sort of weather is going on outside. An indoor hot tub is perfectly ready for you 365 days out of the year. A second benefit of having your hot tub indoors is the privacy it brings. Some bathers may prefer a more private setting and can feel exposed or uncomfortable when susceptible to the outdoors and nosy neighbors. There is no unwanted attention when your hot tub is indoors and provides you enough privacy to feel comfortable every time you take a soak. To learn more about the different hot tub features available, download a hot tub buyer’s guide.